Select the winner based on the data and reporting. Unless otherwise indicated, all data are as of 2012. 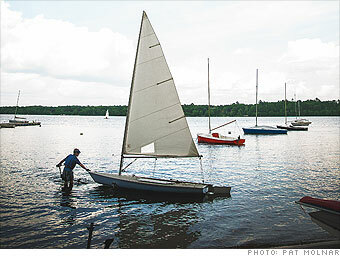 CNNMoney's Best Places database of 1,900-plus U.S. places includes towns with populations between 10,000 and 50,000. Projections provided by Onboard Informatics are based on available U.S. Census and Bureau of Labor Statistics data. Onboard Informatics is a data services company that specializes in working with real estate, media and technology companies. Median family income data is based on U.S. Census/Onboard projections/aggregations. Purchasing power is the adjusted median family income using ACCRA Cost of Living Index for 4th quarter of 2012, as provided by Onboard. The ACCRA Cost of Living Index measures relative price levels for consumer goods and services. Auto insurance data represent average quotes consumers received from 19 auto insurance companies that participate in CarInsurance.com's website. Note: Average quotes aren't available for Massachusetts towns. Median home sale price is compiled from actual sales transactions collected by Onboard Informatics from county and municipal assessor's offices for 2012. Only includes sales within the place boundaries. Collection and analysis of geographic data (geo-spatial aggregation) by Onboard Informatics. Underlying test scores are from GreatSchools.net. Onboard then calculated the values, which represent the percent by which the school district's Math and Reading test scores fall above or below the state's average scores. Percent of students in public and private school represent students attending schools in the boundary area only, and may not add up to 100% in cases where students attend certain county or state schools. Onboard Informatics projection/aggregation. Air quality index are county numbers. Source: EPA, Onboard Informatics projection/aggregation. Personal crime incidents are per 1,000 from 2011 FBI incidence reports and Onboard Informatics aggregations. Property crime incidents are per 1,000 from 2011 FBI incidence reports and Onboard Informatics aggregations. Percent of workers with long commute times from U.S. Census and Onboard Informatics projections. Percent of population that walks or bikes to work from U.S. Census and Onboard Informatics aggregations. Weather data from NOAA National Weather Center observation reporting stations. Collection and analysis of geographic data (geo-spatial aggregation) by Onboard Informatics. Percent of population that is married or divorced from U.S. Census and Onboard Informatics projections. All content based on public, private and governmental sources - and while we make every effort to identify errors or omissions in these sources, neither Onboard Informatics nor CNNMoney.com guarantees the accuracy of this information.